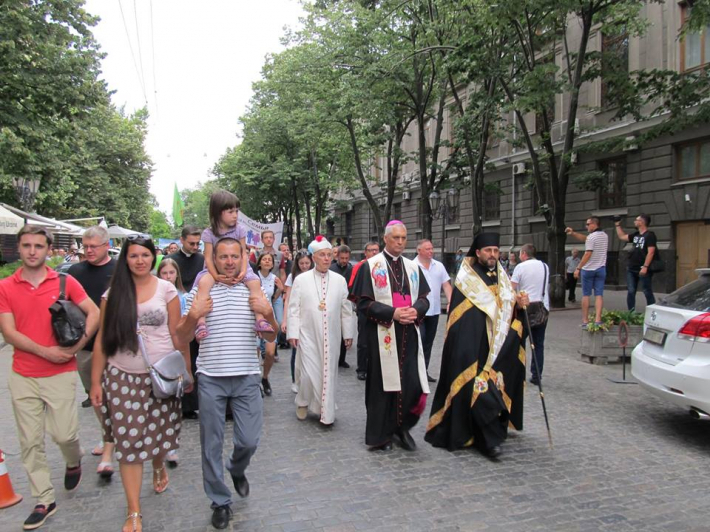 March for a life and family values was held in Odesa June 10, 2018. Members of different confessions, mainly Exarch of Odesa Mykhailo Bubniy, UGCC and bishop of RCC Bronislaw Bernadski. The Head of UGCC visited in Odessa frigate "Hetman Sahaidachny"
The event was held under the slogan “Father, mother and I – is a happy family”, what is, actually, is a feature of a healthy family, society and state, according to a greeting word by bishop Bronislaw. Hence, bishop Mykhailo Bubniy glanced into the past, recalling all ideologies, which we have been imposed for the last centuries. He also drew attention to danger provoked by gender ideology, what is tempted to be implemented within our country. It, in turns, leads to a shameless law what diminishes family values. Bishop Mykhailo stated his opinion, citing the following verse from Scriptures: “God created man in his image, in the divine image he created him; male and female he created them”, Gen 1, 27. Representatives of different confessions and governmental delegates, who don’t stay aside their children’s future life, also had a chance to talk to people. At the end of this peaceful manifestation all together prayed “Our Father”, asking God for help to instruct those who are determined to vote for this unconstitutional law. Let us pray for a virtue of respecting true family values, for our families to stay open for a life, for a dominating God’s law. May the Blessed Virgin Mary sustain us with her prayers and intercession.